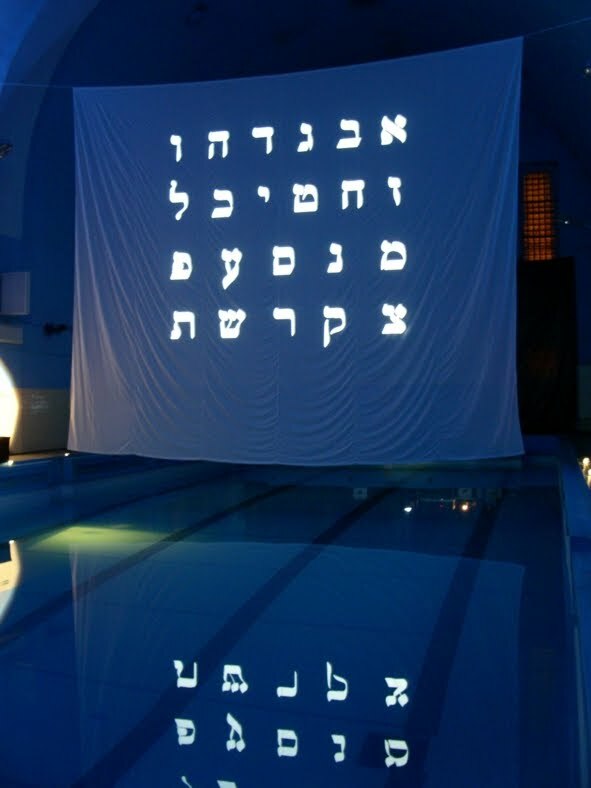 Alphabet, 2006, a performance, the swimming pool in the former synagogue building in Poznań. 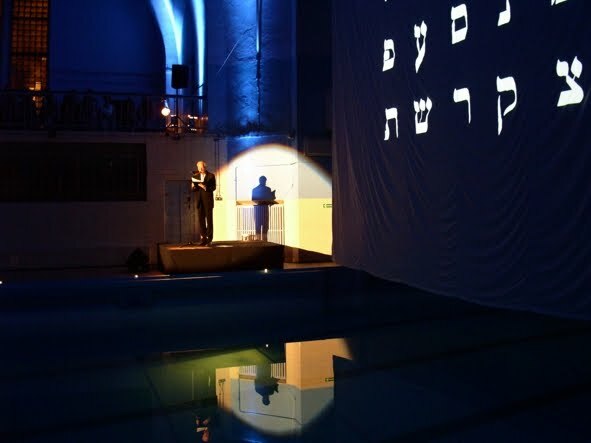 It was staged for the 9th Day of Judaism and the 16th Malta International Theatre Festival in Poznań. Edward Lubaszenko participated in the first version of this performance, Aleksander Machalica in the second. There is much to be said about the love that The People of The Book bestow on the Letter and the Word. 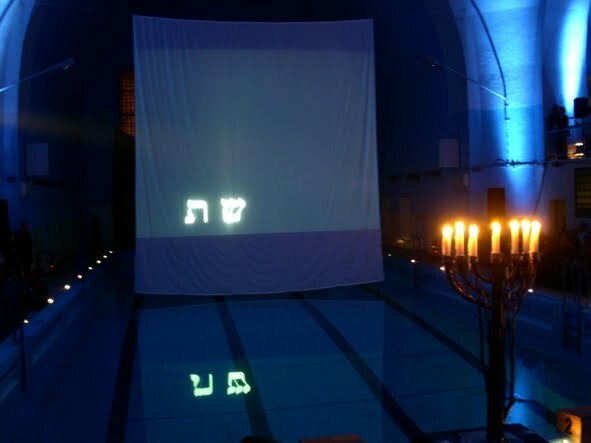 The Hebrew alphabet in the swimming pool, a former synagogue, prompts a reflection, perhaps above all, in those who already know these letters shared the same fate as the people ... The inspiration for Alphabet was the novel Blood from the Sky by Piotr Rawicz. This moving portrayal of the destruction of gravestones and letters breaking asunder, appeared to me as a symbol of the end of all human values and at the same time, paradoxically, a moment of a complete understanding of the sense of those values. Another fragment of this novel, also recalled in Alphabet, completes this portrayal: a remarkable, almost Lévinesque dialogue, between Lev of Miropol and God – giving birth to a question that reaches still further. A question, which it turns out, is the answer. 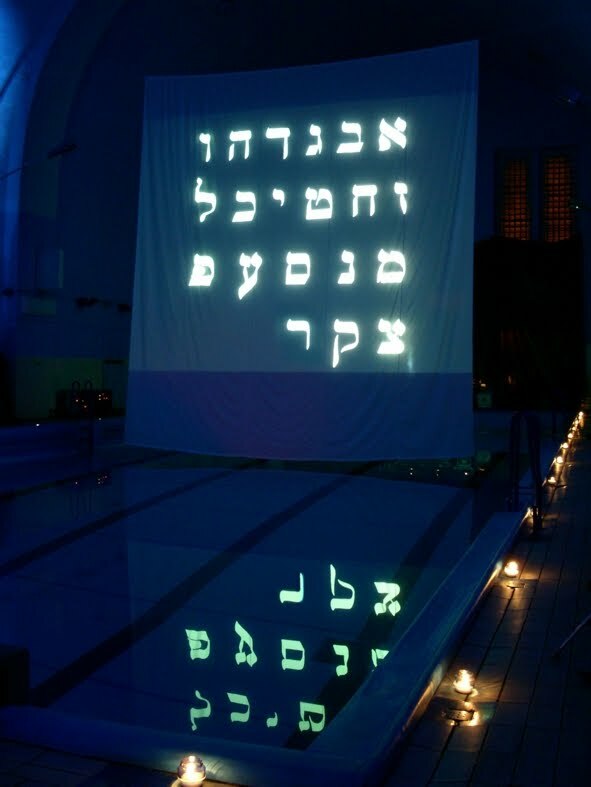 On an enormous drapery stretched above the swimming pool, a symbolic curtain over the temple’s inner sanctum, appear the letters of the Hebrew alphabet, reflected in the mirror of the water below. 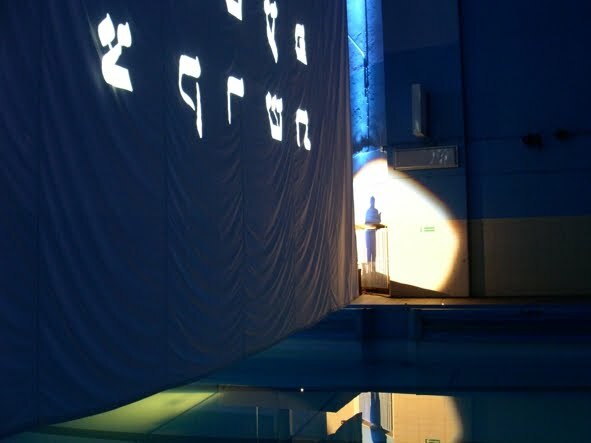 At the same time the space, which was once a synagogue, resounds with plaintive song – Jewish prayers from an archival recording by cantor Estrongo Nachama. 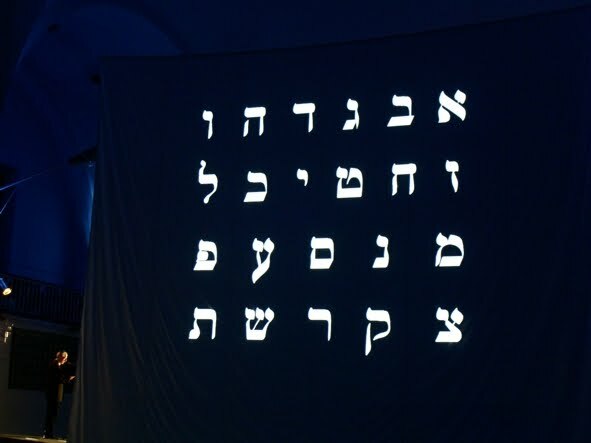 After the last Hebrew letter appears, the singing dies, whereupon an actor begins to read the text – fragments of Blood from the Sky by Rawicz, Psalm 84  and Psalm 25 . 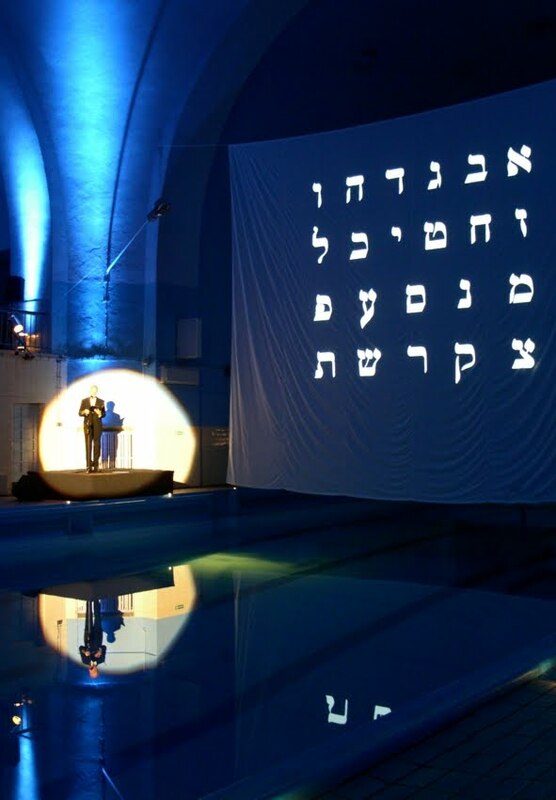 This is followed by a recitation of the Hebrew alphabet. 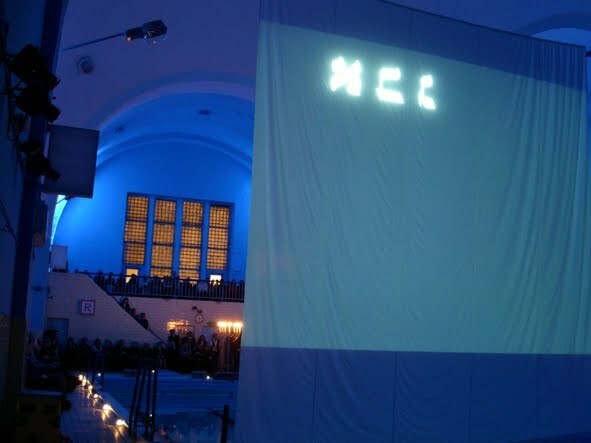 As the Hebrew letters are read out, their image progressively disappears. After the last of the letters disappears, a silence falls, pregnant with emptiness. 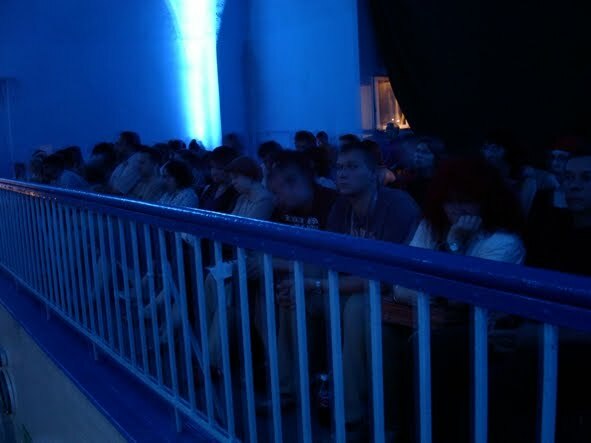 The cantor’s singing then returns bringing this passion play to its end. Second version of Alphabet (4/07/2006). 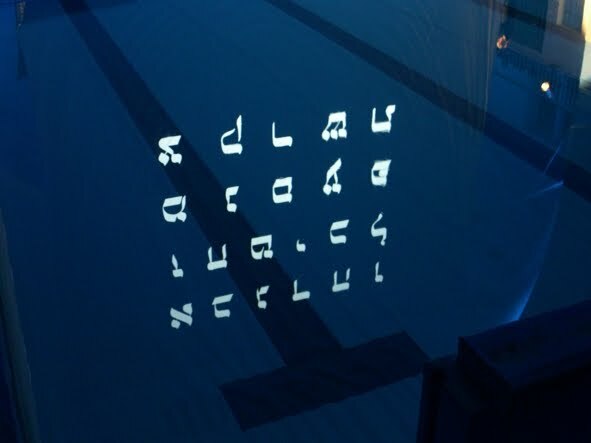 First version of Alphabet (15/01/2006). 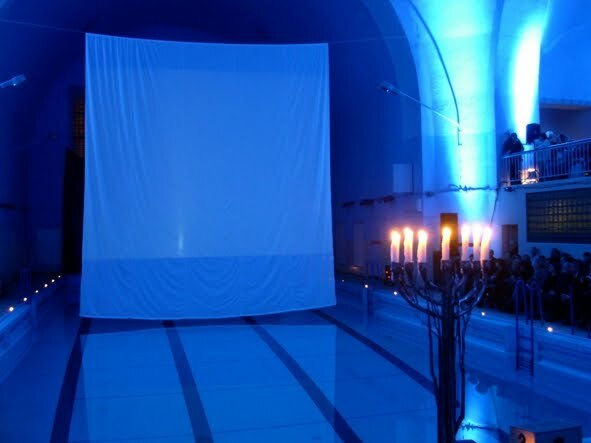 Alfabet, 2006, performance na pływalni w dawnym budynku synagogi w Poznaniu. 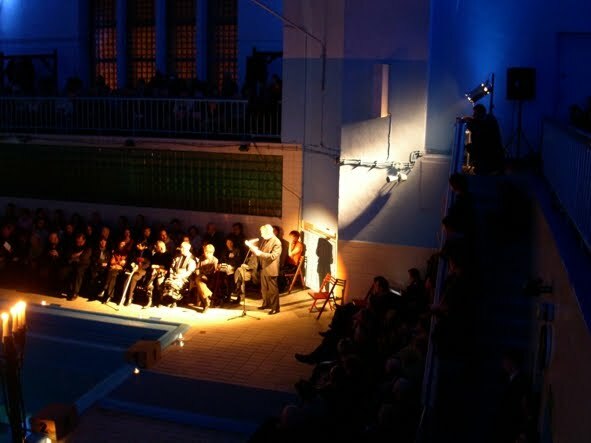 Wykonany podczas IX Dnia Judaizmu i XVI Międzynarodowego Festiwalu Teatralnego Malta. W pierwszej wersji wystąpił Edward Lubaszenko, w drugiej Aleksander Machalica. 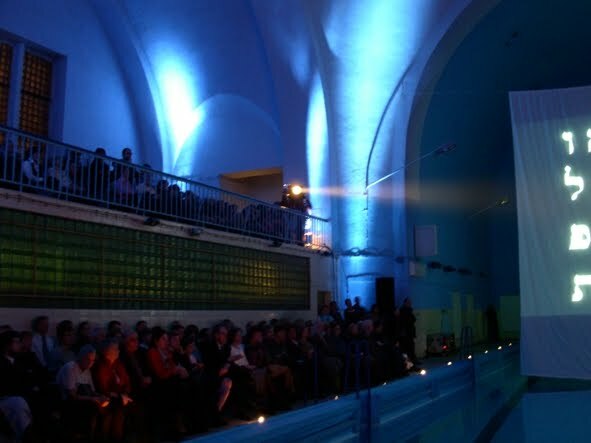 pełnego sensu. Dopełnieniem tego opisu jest inny, też przywołany w Alfabecie, fragment tej powieści – rewelacyjna, chciałoby się powiedzieć, że Lévinasowska rozmowa Lwa z Miropola z Panem Bogiem – daleko sięgające pytanie. Pytanie, które okazuje się odpowiedzią. 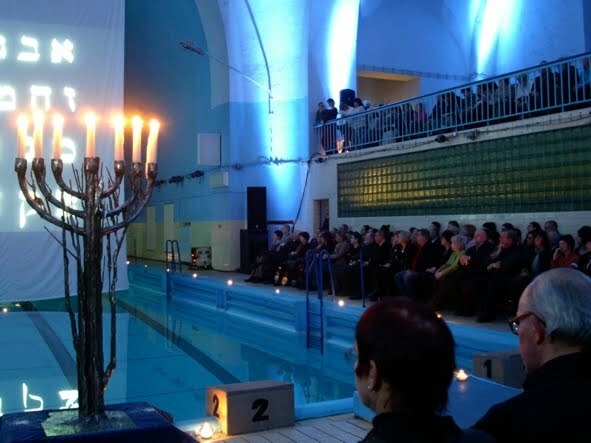 Na zawieszonej nad basenem wielkiej draperii – symbolicznej zasłonie przybytku pojawiają się 22 litery alfabetu hebrajskiego. Alfabet odbija się w lustrze wody. 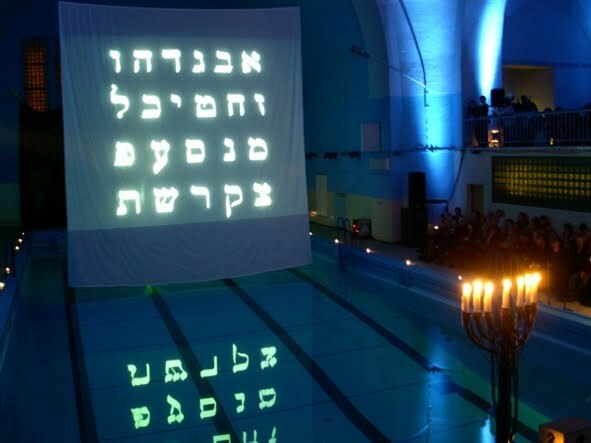 Jednocześnie wnętrze, które kiedyś było synagogą, wypełniają pieśni – modlitwy żydowskie odtwarzane z nagrań archiwalnych. Śpiewa kantor Estrongo Nachama. Po pojawieniu się ostatniej litery śpiew cichnie. Wtedy aktor rozpoczyna czytanie fragmentów Krwi nieba Rawicza, Psalmu 84 (83) i Psalmu 25 (24). Czytanie kończy recytacja alfabetu hebrajskiego. 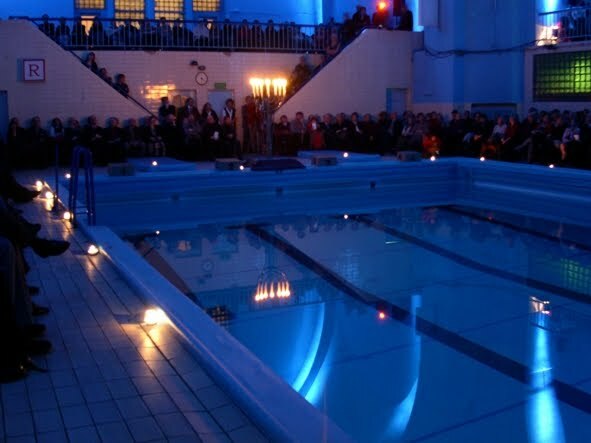 Wymawiane przez aktora litery stopniowo znikają. Po zniknięciu ostatniej litery nastaje cisza zabarwiona uczuciem pustki. 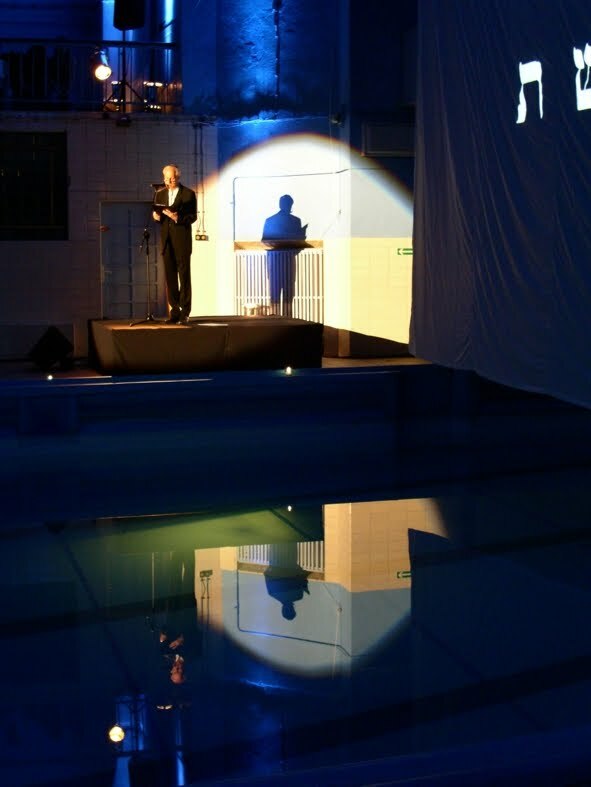 Wraca śpiew kantora, który kończy misterium.